Recently I started reading a book which has terrified me. Some of the economists stated that the “recession of 2008” had ended in 2009. Then why was work still scarce? Why was unemployment still high? As the stock market started to seem to regain it’s vitality and strength, still the economy as measured by profits, gross national product, average gross earnings, still were flat-lined. What is it that is going on? In the past, the recessions of 1982 and 1992 only lasted for a year or so, and in it’s cyclic nature, the economy would go full-circle. Here we were in 2013, five years later, and things have not significantly improved. Is it the government? We had a Republican president, we had a Democratic president, we’ve had a Republican, then a Democratic majority in Congress and back again. What was it that seemed to be suppressing our economy? Reading this book entitled, “AFTERSHOCK: Protect Yourself and Profit in the Next Global Financial Meltdown” I was shocked by the word “next.” This book is written by David and Robert A. Wiedemer and Cindy Spitzer, three economists who gained credibility and fame when they accurately predicted the 2008 Global Financial Meltdown in 2007. No one listened to them, or even gave their predictions any consideration. Then it hit. All of the mainstream “cheerleader” economists had been citing the popular lines, while not really investigating the true nature of the economy. This trio, is explaining the melt-down as not a normal, historical, repetitive, cyclic movement of the economy. This was unprecedented, unforeseen, first of it’s kind global meltdown. The result of a multiple bubble economy. They explain that there are 6 bubbles, 4 of which burst starting in 2008. The scary point they make is it is not over yet. There are still two more bubbles they predict will burst in the next 5 years. 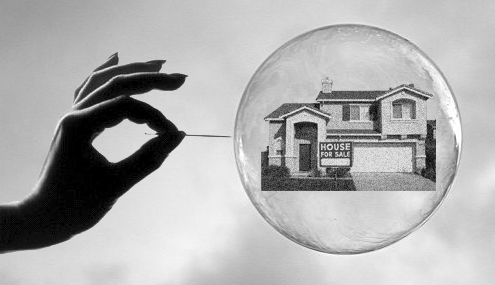 The first bubble is the HOUSING BUBBLE. This is where in 2008, housing prices tripled (300%) raising house prices through the roof, and creating gigantic gains in the equity of houses around the country. I recall my house value more than doubled, almost tripled in value. The question is, how can these values increase dramatically, while in reality, the earning power had only increased 2%? Where was all of the money coming from? If it wasn’t produced, where did it come from? It came from speculation. It came for over-pricing. It came from artificial means. It was only on paper, because without a major gain in earnings, the home-buying sector, really could not afford these prices. It was all a big bubble. The second bubble is the STOCK MARKET bubble. Recall how the Dow Jones Industrial index jumped up dramatically after the initial crash in 2008? What was happening was the government was stepping in and buying debts and bailing out the “too big to fail” banks using money which the Federal Reserve simply was “printing up.” This is like funny money. It is just printed up, and is not the reflection of any increase in the Gross National Product (GNP) or our resources. It is just artificial. It is a band-aid, which temporary has been fueling the “recovery” of the stock market. The shocking fact is they printed up over one trillion dollars of money to boost the economy. ($1,000,000,000,000.00) This is another bubble which cannot be sustained, because you can’t just keep printing up money. Sooner or later it had to burst, as it did and will burst again. The third bubble which burst was the PRIVATE DEBT bubble. Everyone heard about the “sub-prime” mortgages that failed. There also what is now called the “liar loans” loans made which the consumer receiving the loan could NOT pay it off given their current circumstances. Because house prices kept rising, it was assumed they would continue to do so. Therefore, because of the equity in the house which seemed to be guaranteed to keep growing, poor investment credentials were over-looked and the loans were awarded, and the banks just packaged these “bad loans” in bundles and sold them to others, thinking they had thus rid themselves of the danger. Once these “liar loans” failed one-by-one, it became a rolling boulder which then triggered an avalanche. Major banks failed as a result of this heady period of greed and excess. The fourth bubble which burst is the DISCRETIONARY SPENDING bubble. This is the extra money the consumer has which is not needed for necessities like food, power, medical costs, housing costs, etc. This is money which the consumer can spend on luxuries and non-essential items, like Smart phones, video games, new cars, expensive vacations, recreational vehicles and equipment, Laker tickets, home theater systems, you know, the fun stuff. With the illusion of prosperity with the exagerated house costs, the ballooning equity, the expanding credit allowance, the American consumer felt they had money to burn, so they spent, spent, and spent. Again, this was a bubble, there wasn’t the extra money they thought they had. These all built up credit card and credit allowance debts, with their exoberant interest rates, which the consumer who did not see their earning power increase, could not and would not pay. Pop! That bubble burst too. 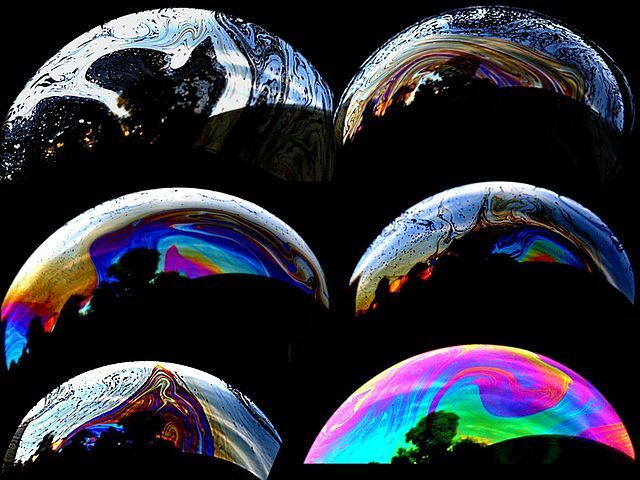 The cascading effect of all four of the above listed bubbles bursting created the global financial meltdown, which impacted not just the United States, but all of the economies around the world which are tied to us by trade, loans, purchases, and international commerce. 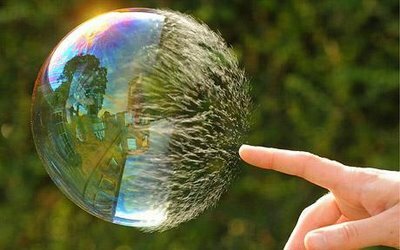 Each bubble bursting caused the others to burst, and there was no reinflating these bubbles because their source was artificial, not a real gain. It was all just fluff, treated as a firm, concrete foundation for investments. 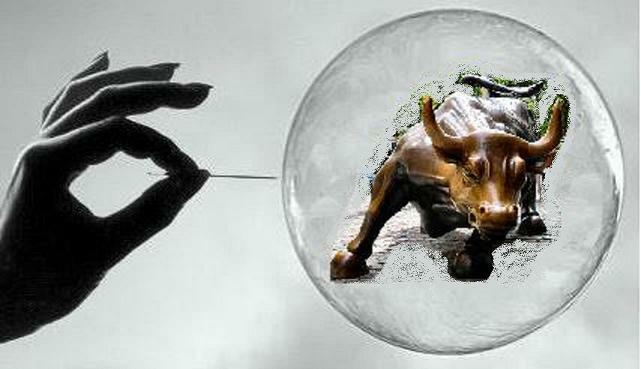 You cannot reinflate these bubbles to pre-meltdown levels, because they never were real. Houses were not worth 300% more, the markets on the U.S. Stock exchange did not make record-breaking production, the GNP and earnings made were in single-digit increases, while the banks and stock market celebrated triple-digit gains. All of this was just a house of cards. The moment someone exclaimed, the emperor has no clothes, sheer panic set in. What triggered the meltdown, was the psychological reaction when institutions that were thought to be “too big to fail” actually failed. The economy is governed ultimately by our emotions and are gut-feelings, our visceral reactions to what is being said, and not said. Now the part of the book which terrifies me the most is that the authors say there are still two bubbles left that have not burst (yet) and they predict they will burst between 2013 and 2018. 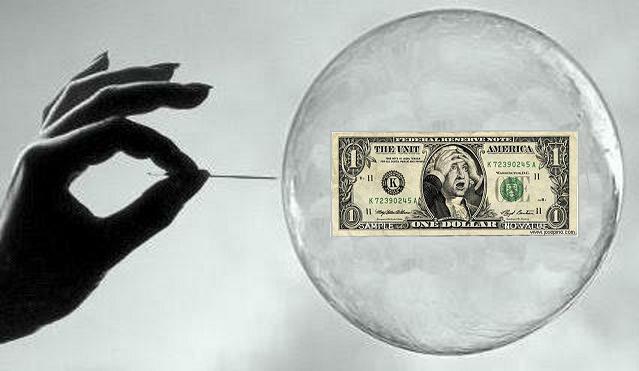 The fifth bubble is THE DOLLAR. Remember how the Federal Reserve’s solution to the meltdown? They printed up one trillion + worth of paper money and gave it to bail out the banks, and to buy bad debts, and bad loans, and bad bonds. This money which was just printed up to stop the meltdown has only succeeded in slowing down and delaying the inevitable failure of these enterprises. The three economists predict the increase in inflation, where the buying power of the U.S. dollar is weakened. They do not predict runaway, hyper-inflation like was seen in pre-world war II Germany, where it took a suitcase of Marks to buy a loaf of bread. However it will be high, like 10% and up. Imagine gasoline at $42.00/gallon and you get an inkling of what might be yet to come. When the dollar bubble bursts because of the unrestrained printing of dollars and dumping it into the market, it will add to the damage caused by the first four bubbles bursting. 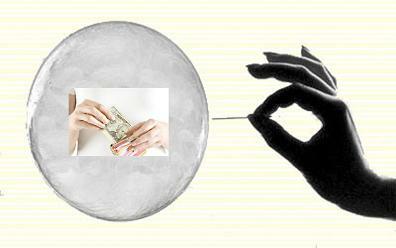 The sixth and final bubble to burst is the GOVERNMENT DEBT bubble. You keep hearing politicians lament about the growing national debt. In September of 2012 it was at $16.5 trillion dollars. (Note: The National Debt Clock did not have enough numbers to indicate this, so it read $6.5 trillion) Already the nation’s credit rating on the international market has dropped from it’s previous AAA rating. Just as the third world countries who are burdened by debts so great that the interest on these loans exceed their Gross National Product, the United States is heading to the point where this debt will just NOT be paid. When they shout out “the emperor has no clothes” the government debt bubble will burst. We have been borrowing money from China like crazy. If we default on these loans, the consequences will be devastating. China is the fastest-growing middle class in the world. When they realize their investments in the United States have failed, the psychological impact on the world will be beyond comprehension. Our currency bare the inscription “In God We Trust.” If you are a God-less Communist, there will be no such trust. If you imagine the bursting of these last two bubbles you can begin to see why these three economists are not as positive about the current state of the economy. They are actually predicting a 90% drop in the U.S. Stock market for all businesses relying on the American Consumer’s purchasing power. 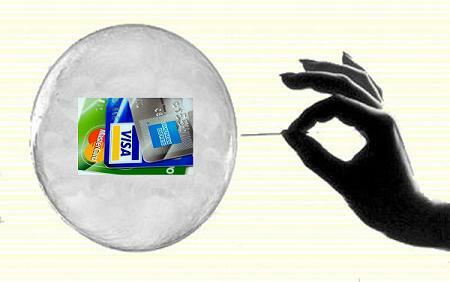 With all six bubbles bursting, these consumer-generated businesses will fail. They predict this recession, is not a recession alone, it is a global, economic meltdown. They say, get ready for hard times for the next, five years. The three economists say life will go on, and they don’t forsee starving in the streets, and people fighting for food with guns. They just predict it will be hard, and difficult, and a struggle. As the meltdown is triggered by the psychological and emotional reactions of the consumers and investors to what they hear, and say, and think; if you keep your mind in the present and the here and now, you can see what is the best actions to live a happy, and prosperous life. It is not about how much you have, but how you live with what you have. I’ve seen stories about children in 3rd World countries that are playing with a puppy that are happier and more fulfilled than the stories about rich kids, surrounded, and bored by all the toys that the filthy-rich can buy. It is this idea, which allows me to move my fears, panic, and worries to the side. I’m not asleep to this ticking bomb, but I’m not the victim of it either. As of December, 2017 the U.S. National Debt has reached $20.6 trillion USD. There still was no bubble-burst for the national debt which was predicted for 2014.